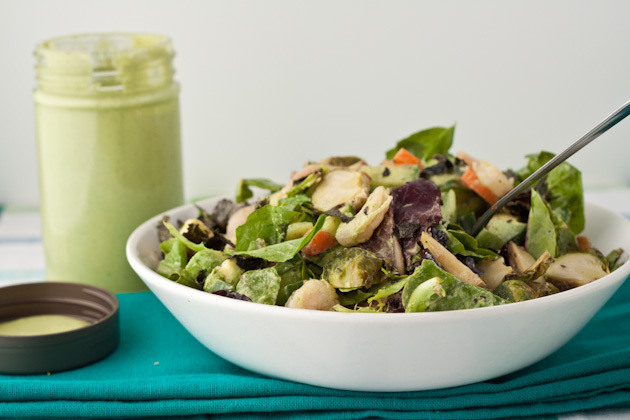 This weeks’ salad challenge posts: Introduction, Sweet + Creamy Broccoli Salad I find that I am a lot more excited to prepare a big salad everyday when I have a fun and exciting homemade dressing to depend on. Some of my favorites are Smokey Bear Dressing, Sweet Almond Spread with a bit of water, and Maple Balsamic Dijon. But no dressing compares to the power of the Green Goddessphere. I promise, it’ll make any salad sing. No matter what other random dressings I create on a weekly basis, there is always a batch of green goddessphere in the fridge. It combines perfectly with mashed hard boiled eggs, makes for a delicious veggie or chicken finger dip, and; of course, is a great addition to any greens salad, including this one! 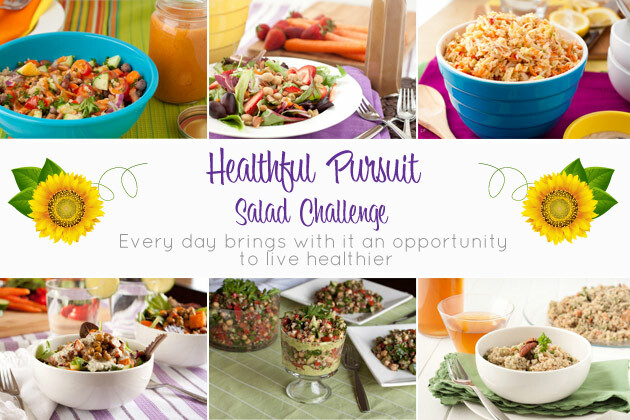 This salad has all of the flavor of a California roll but with 0 grains and amped up veggies! 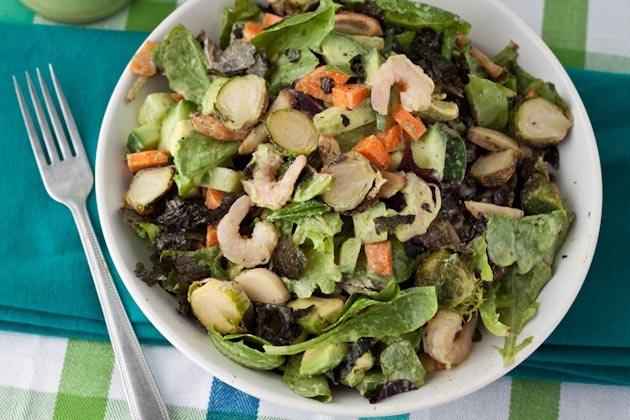 Crumbling up nori sheets in your salad is a great way to increase your iron and iodine content easily which helps to maintain healthy blood and a happy thyroid. 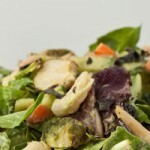 If you’re not a Brussels sprout fan, feel free to opt out. I love the texture they bring to salads, but it’s a preference thing. If you’re using, trim off the end of the sprout and cut in half lengthwise. Steam for 2-3 minutes until crisp tender. Remove from steamer and set aside. 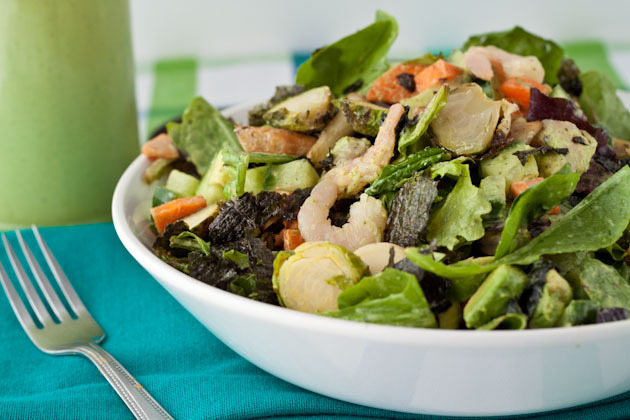 Combine all ingredients in a big bowl, topping with green goddessphere dressing and stirring to coat. 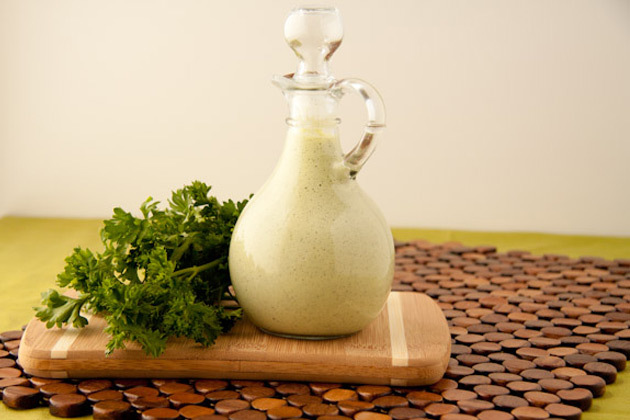 What’s your favorite homemade dressing recipe? Feel free to mention or link up in the comments below!